*Brand new Yanmar V8 370HP motor and Hamilton jet unit* This awesome GBB aluminium jet tender is the ideal island hopper! Fully refurbished by the fastidious owner, an ever reliable Yanmar V8 turbo diesel was fitted with a new Hamilton jet unit in late 2018. It has since done little work and is surplus to the owner's requirements. Originally built to survey for WA Fisheries, she would be able to be returned to survey at the purchaser's cost with minor modifications and upgrades. 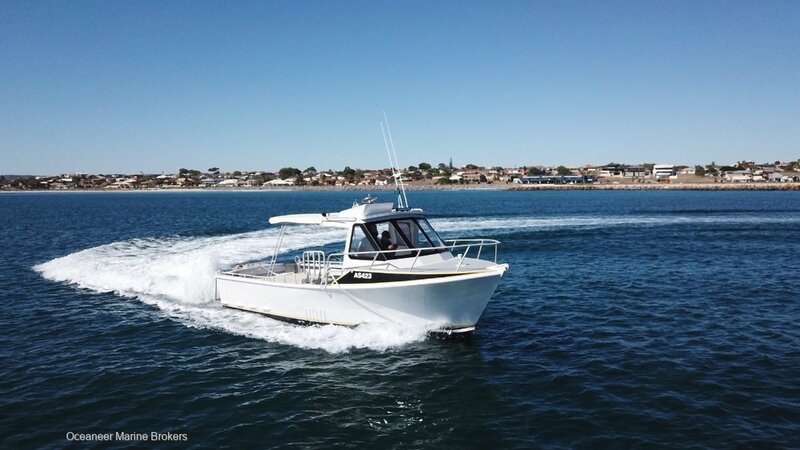 She has two great dive platforms at the transom allowing for safe water entry, a pot tipper and electric winch, all new wiring, Fusion stereo, VHF radio and dual helm stations. The roof mounted helm station is a very clever addition which gives the skipper a high vantage point for navigating the tricky bays at the Abrolhos and Rotto. A half length canopy provides the boat's occupants with ample shade. She performs brilliantly at speeds up to 36 knots with a very economical cruise speed between 25 and 30 knots. It is possible to add a 100L removable fuel tank to the transom for those longer trips but the 170L tank below deck is ample when doing day trips. A licensed trailer is included with the sale.